This time we set for yet another destination. This was not planned. The difference between this tour and the previous ooty-tour was that we decided to take our new indica vista quadrajet for the long journey. And so we embarked upon the journey on 24th December 2009. 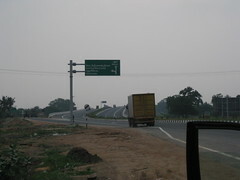 It was 11 O’ clock in the morning by the time we left the electronics city and hit the beautiful four lane highway. The car cruised along effortlessly. We took small breaks of 10 – 15 minutes after every 1- 1.5 hours. The road was very good and there were no diversions or turns. So we didn’t have to ask anyone for the right way. 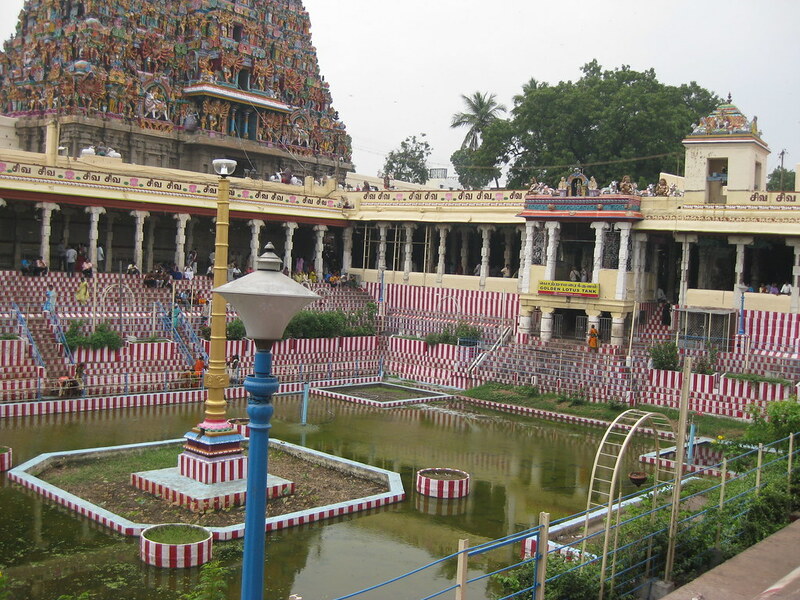 Our immediate destination was Madurai. 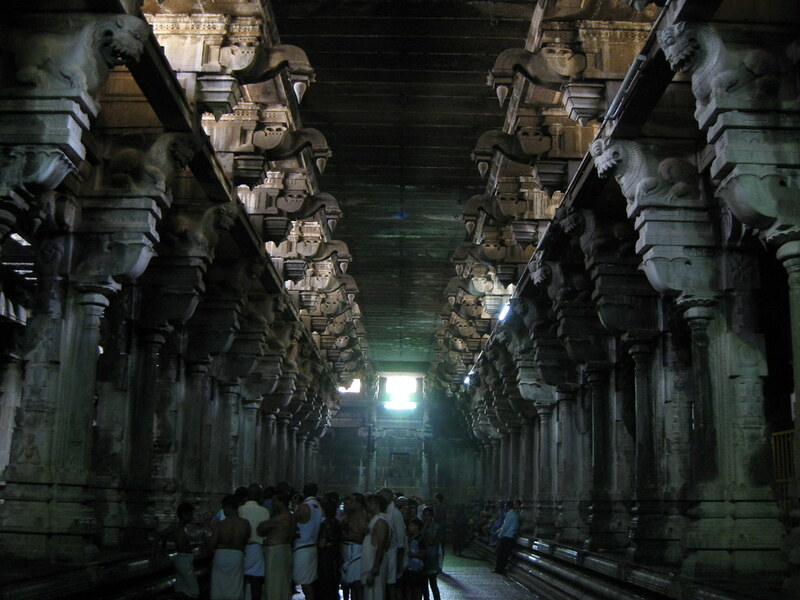 We planned to stay overnight at Madurai before witnessing the well-known Meenakshi Temple. 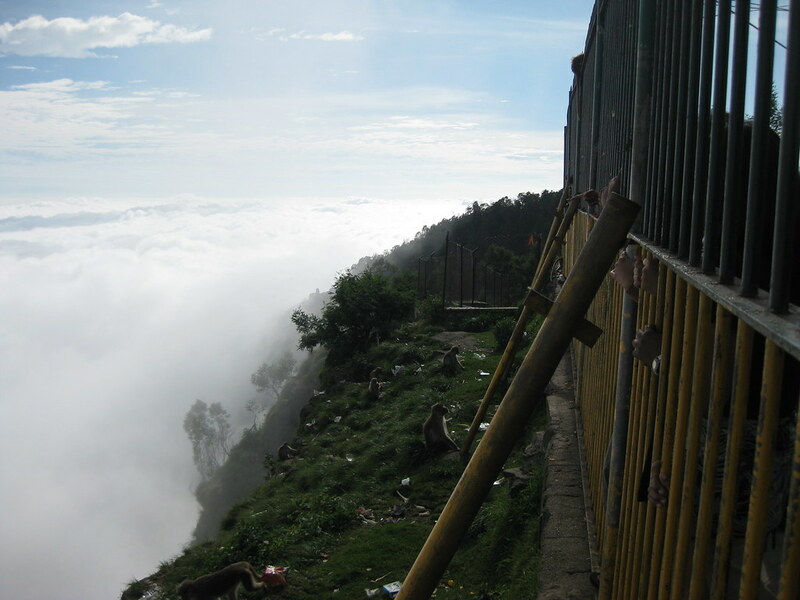 Awesome was the view of the Kodaikanal mountains that could be seen from the highway as shown below. This place was approximately 400 km from Bomanahalli (The place in Bangalore from where we started our journey, i.e. my home). As shown in the adjacent photo, one can see the way towards Kodai Road Railway station suggested by the board (left direction shown on the direction board). We were headed straight towards Madurai. That which held us from going towards Kodaikanal is my inexperience in driving. 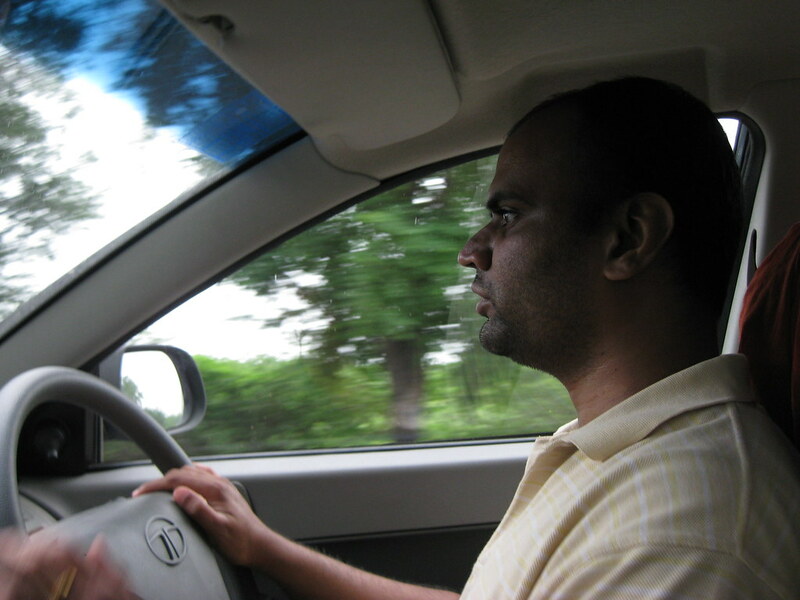 I had learnt driving only a 20 days or so before and recently only had acquired a driving licence. 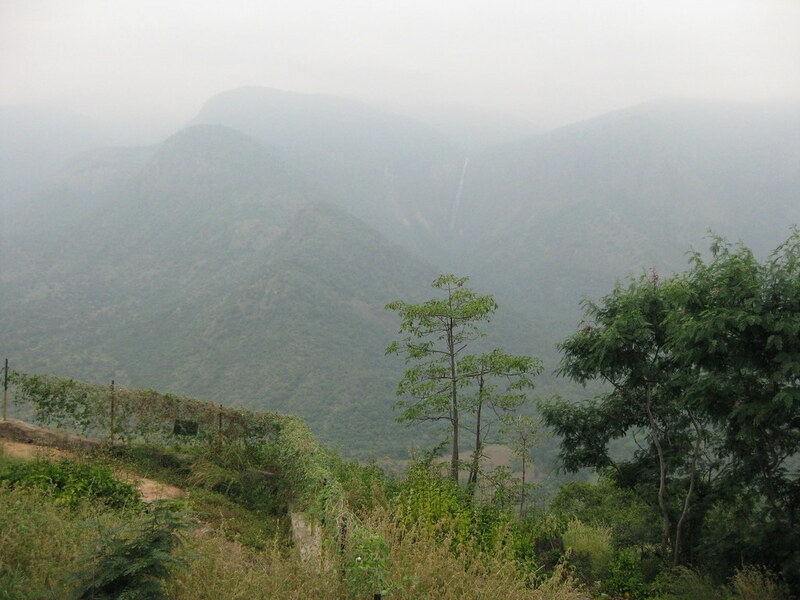 So we decided not to venture the mountainous curves of Kodaikanal. So with a heavy heart we drove ahead, straight towards Madurai. We were feeling hungry by this time as we never found a decent hotel for quite sometime. We managed to find a hotel near the highway and ate chicken fried rice. Only Sanchita preferred Chicken Biryani to Chicken Fried Rice. The food was good here. Then name of the restaurant was Fantasy hotel. We enquired if there were any rooms available but the waiter said there weren’t any because it was a restaurant only. He advised us to enter Madurai, as there were many lodges there. It was almost evening when we reached Madurai. We had to roam for quite sometime inside the city to get a lodge. The rooms were non-ac and we had to pay 1400 Rs for two rooms. End of day1. We were tired and slept like logs of woods. The next day morning we set out for Meenakshi Temple. 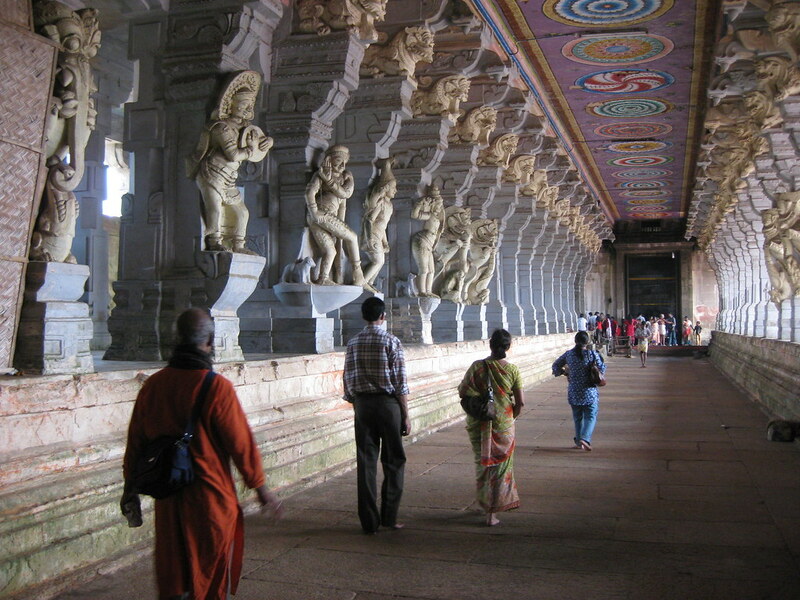 We got help from people to locate the way towards Meenakshi Temple. The city looked old, traditional and holy. The traffic was heavy and I had to maneuver the car left and right to avoid hurting passersby as well as being hit by incoming vehicles. 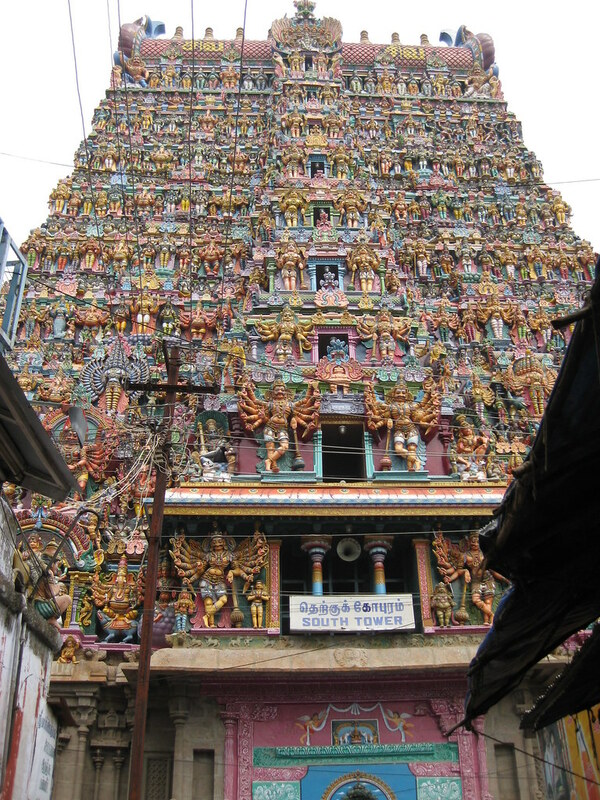 Finally we were on the road that led to Meenakshi Temple. We had a real hard time parking the vehicle as the parking area was full of vehicles. Finally we kept our vehicle in front of a shop which was half open. We assured the shopkeeper that we would return by 30 minutes, as he was shouting at us incessantly. We booked two rickshaws to reach the temple from there. The rickshaws charged Rs. 15 each. It was only a little less than 1 km. The view of the south tower is shown below. We had to stand behind a long queue to take the darshan of God in the temple. 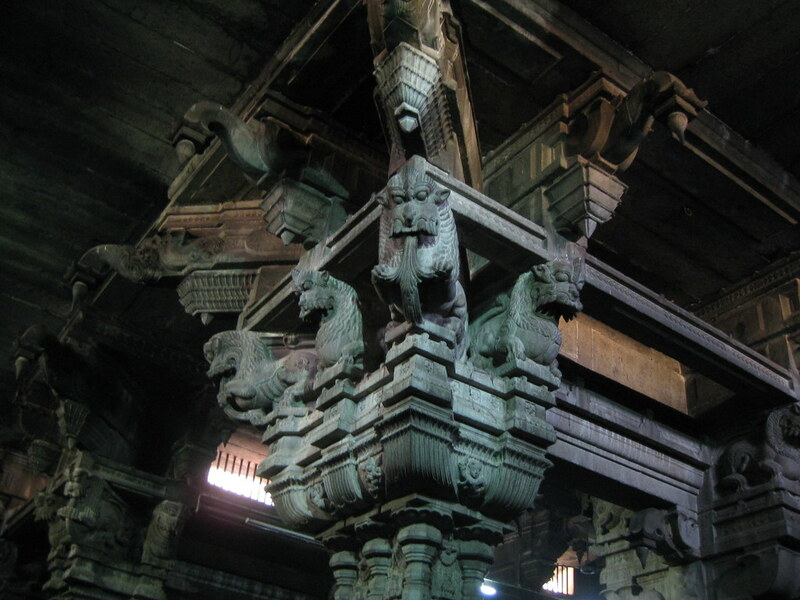 We were simply in awe of the craftsmanship on the rocks of the temple. We came out of the temple finally. We were a little worried for the car because it was parked in front of a shop. And we had promised to return in half an hour. We had already consumed more than 3 hours in seeing the temple. Moreover one person had warned us while we parked the vehicle, that we would be charged with a 500 rs fine as we parked in the wrong place. But luckily we found the car as we came walking from the temple. So now we started our journey towards Rameshwaram. 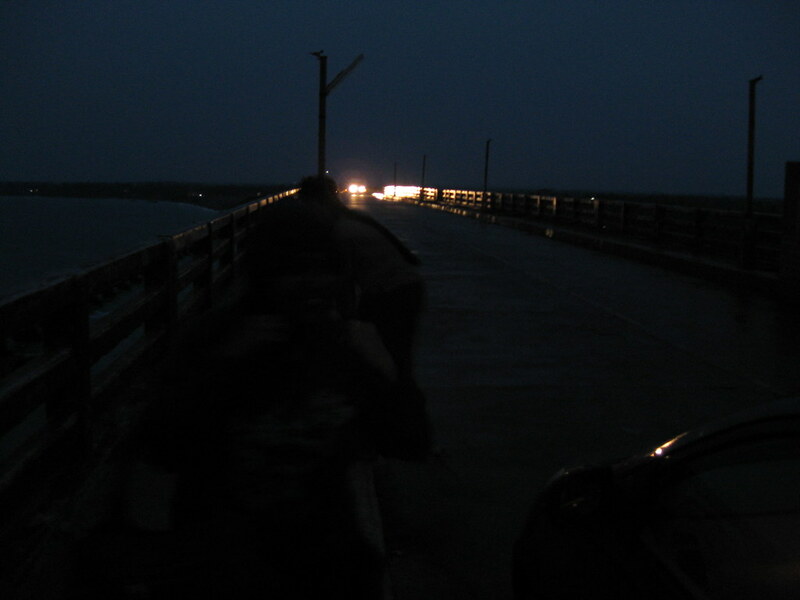 It was dark when we reached the Rameshwaram bridge. It was such an amazing view with the roaring sea on both sides of the bridge. The wind was nice and cold. We parked the car at a corner of the bridge to enjoy the lovely sight ! But the difficult times were infront of us now. 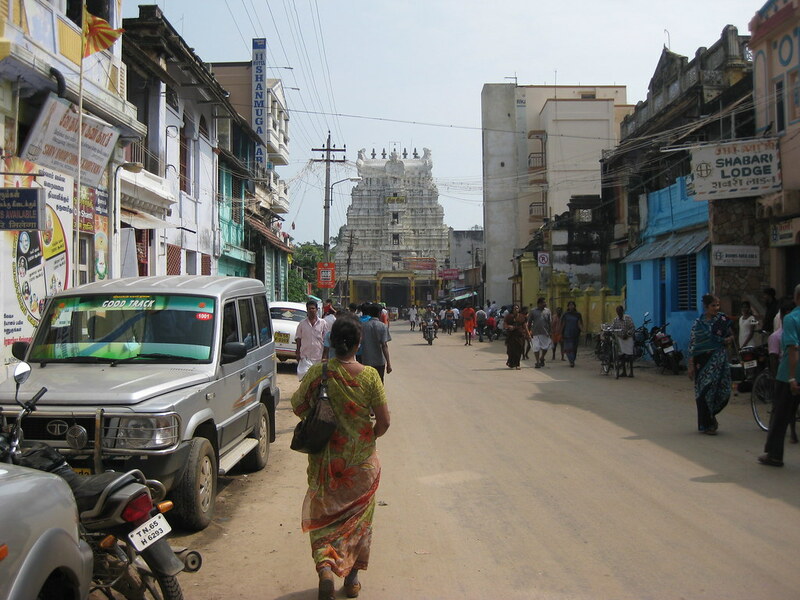 As we drove into Rameshwaram, we found it difficult to get rooms for accomodation. Not a single hotel was empty. Each room was blocked and whichever was left was so bad that we couldn’t have slept if we had taken. So finally we decided to return from Rameshwaram and take any hotel that we could find on the highway. We were lucky as we came across, Tamil Nadu hotel on the highway, some 10 km from Rameshwaram bridge and towards the direction of Madurai. It was a cottage just infront of the sea shore. The balcony opened into an open space of the sea shore and the scenery was awesome from the balcony. We were very happy to have found such a nice hotel and at such difficult time and on 25th Dec. evening (The peak of the season-time). We finally bargained the rent down to Rs.1800. and parked the vehicle just outside the cottage. The photograph below, showing the cottage, was taken the next day morning. We got up very early in the morning to catch the view of the sunrise. But it was cloudy and we only got the view of the sun after waiting for a long time. The sun disappeared in no time. 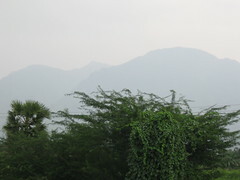 This is the view from the balcony of Hotel Tamil Nadu. Morning Tea arrived and we were sipping tea from the balcony enjoying the lovely view and the cool breeze from the gentle sea. 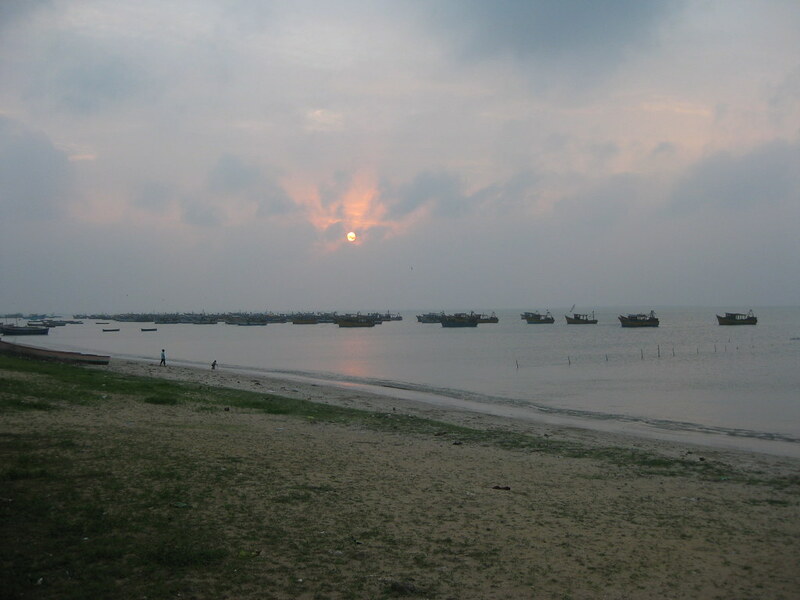 We soon set out for visiting Rameshwaram Temple and Dhanushkodi. 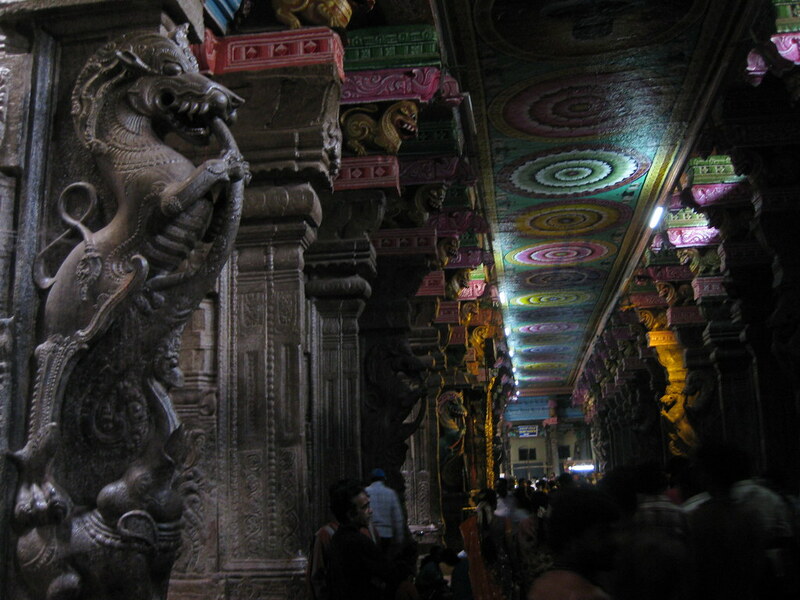 Finding a place for parking was easy in Rameshwaraml, unlike in Meenakshi Temple. We saw people taking bath with utmost devotion in the teerthams. We were soon on our way to Dhanushkoti. 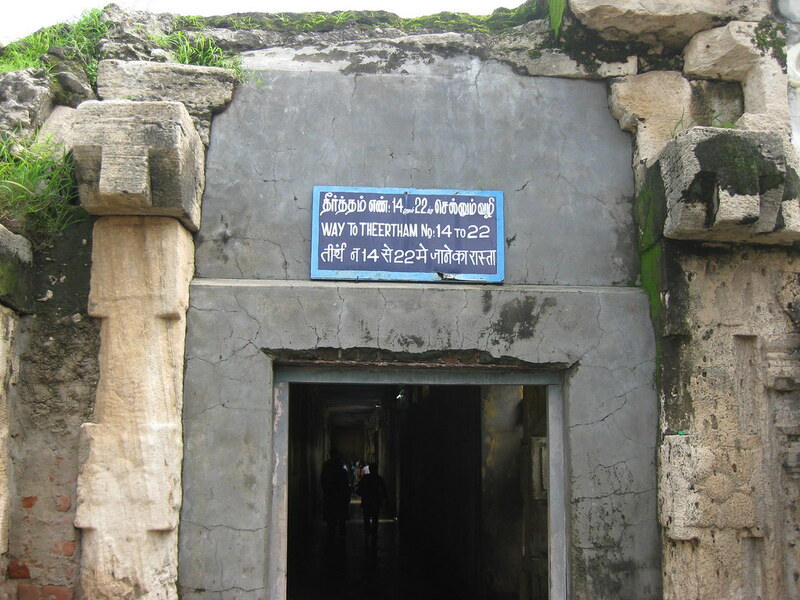 We visited a temple that is dedicated to Bibhisana, brother of Ravana. 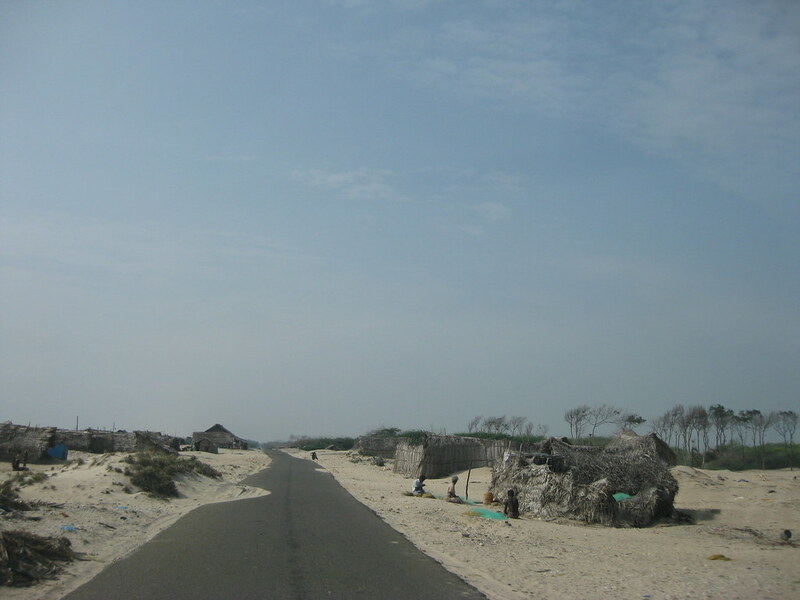 Then we marched ahead to Dhanushkoti, where the road had ocean on both sides. Here the ocean waves were more stronger, and the sand of the beach went a long way encroaching the road from both sides. Small huts of fishermen were scattered here and there in the beautiful landscape. The atmosphere was permeated with the strong smell of dried fish all over. We relaxed here for sometime and then drove back to Tamil Nadu Hotel to our cottage. Checked out, handed over the keys and were soon driving down the highway towards Ramnathpuram. 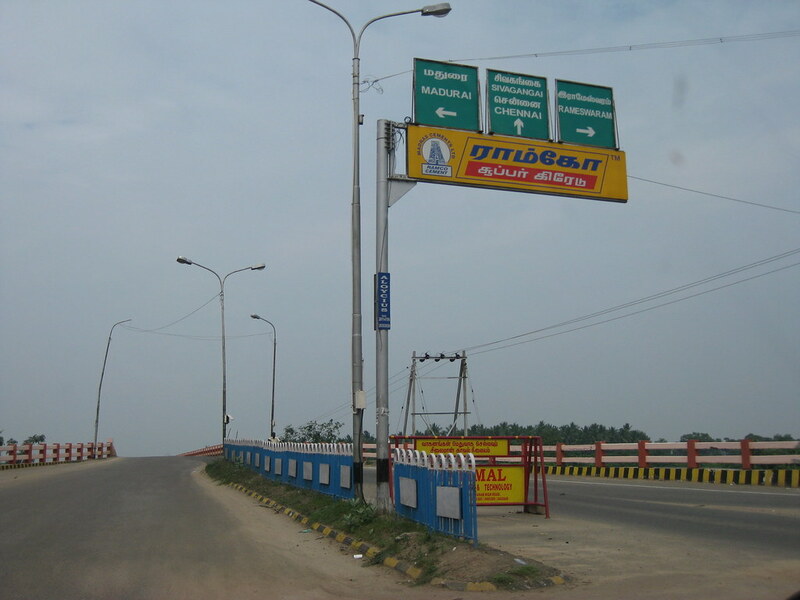 We were told that in Ramnathpuram a road near the railway gate, going leftwards, goes to Kanyakumari. It was getting dark very quickly. So after taking the left turn, and going further ahead, we started searching for a hotel to stay the night. Finally we got one in Toothkedy. 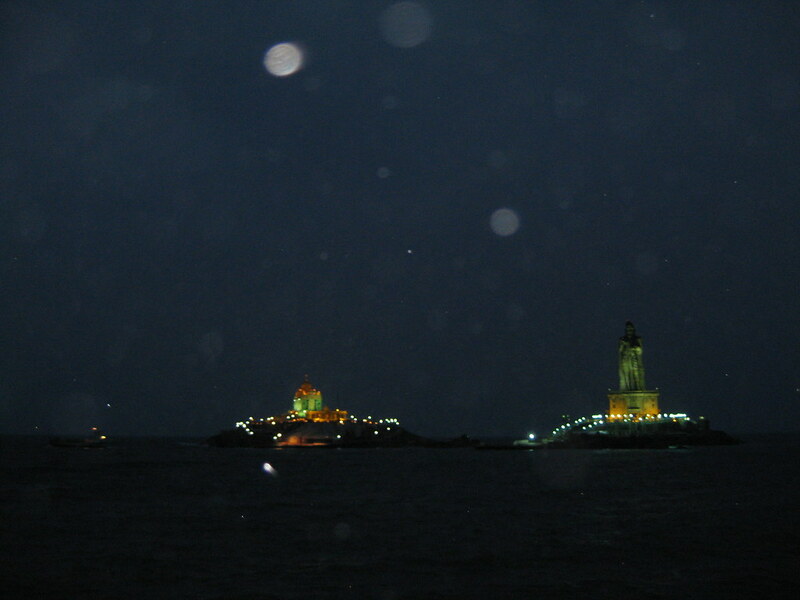 Next day moring, at around 9:30 AM we resumed our journey towards Kanyakumari. 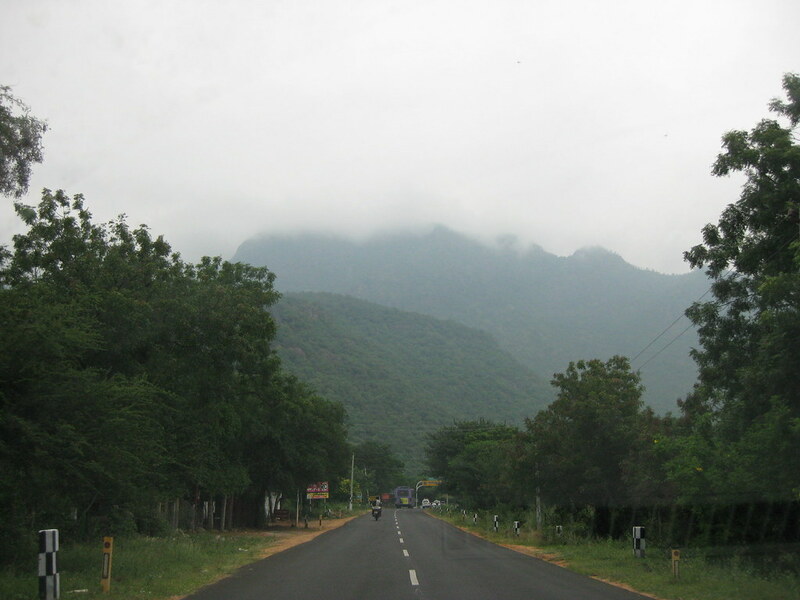 The photo below shows a scenery from the highway, eroute Kanyakumari. 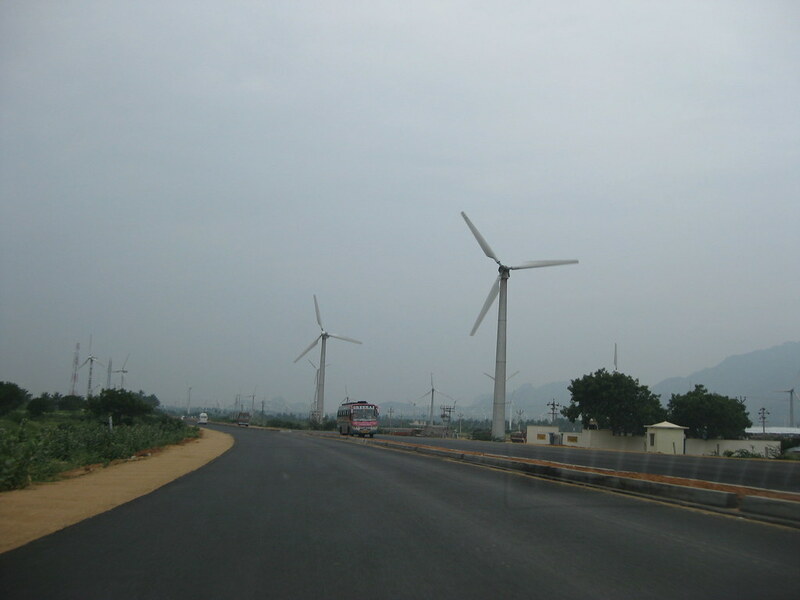 There were countless windmills on both sides of the highway. 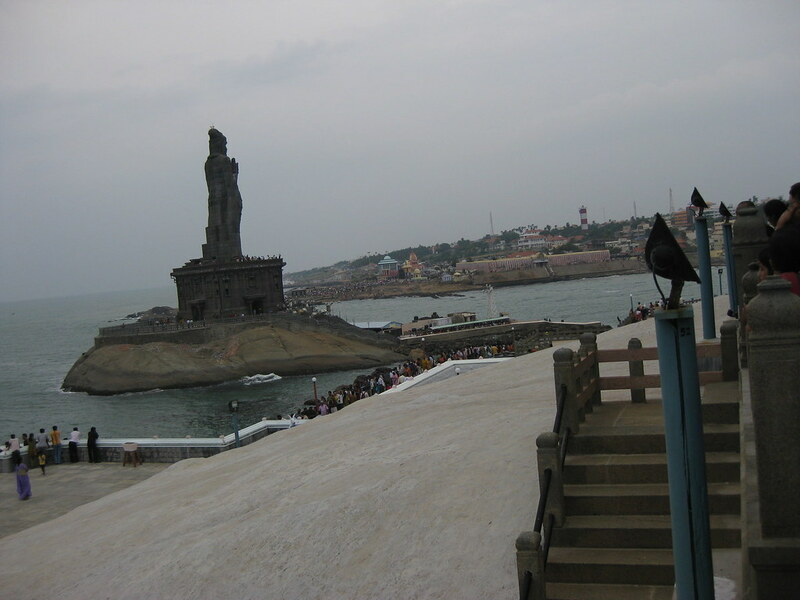 Finally we reached Kanyakumari. Started searching for a parking place. Parked the vehicle a long way ahead, towards right of the main gate and then walked back to enter from the main entrance. 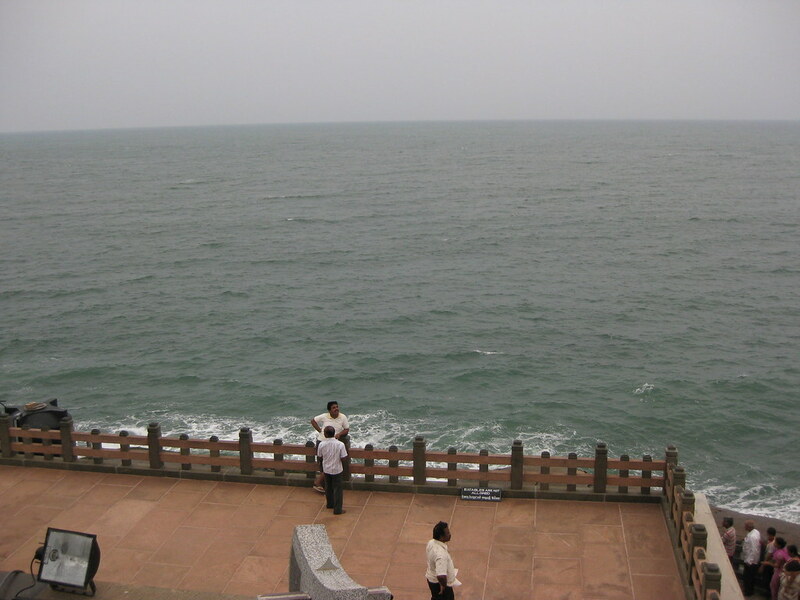 The first thing we wanted to do was to see the Vivekananda Rock Memorial. The queue scared us. It was long. But it was moving fast. Finally the tickets were in our hands and we were swaying back and forth as the streamer marched forward towards the Vivekanda Rock. 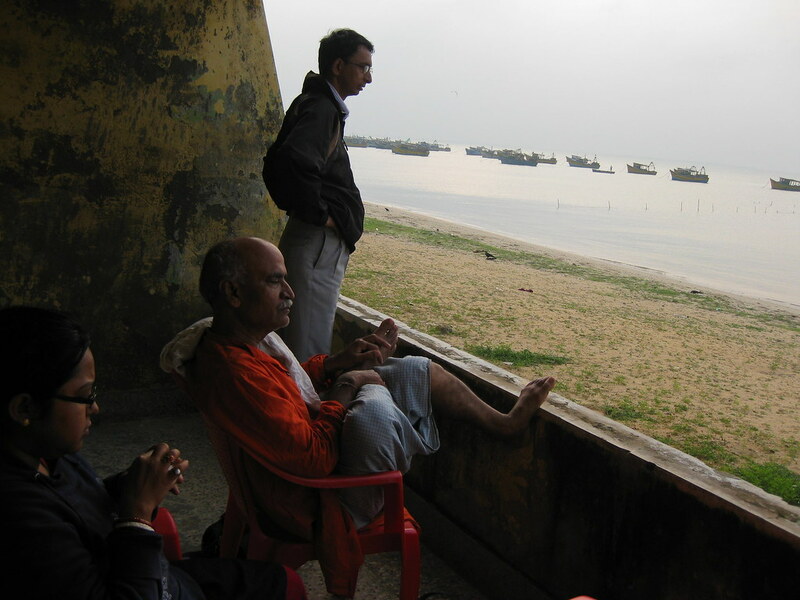 We spent some more time near the sea and finally decided to return back on the NH7. We had planned to stay in some hotel for the night while returning. 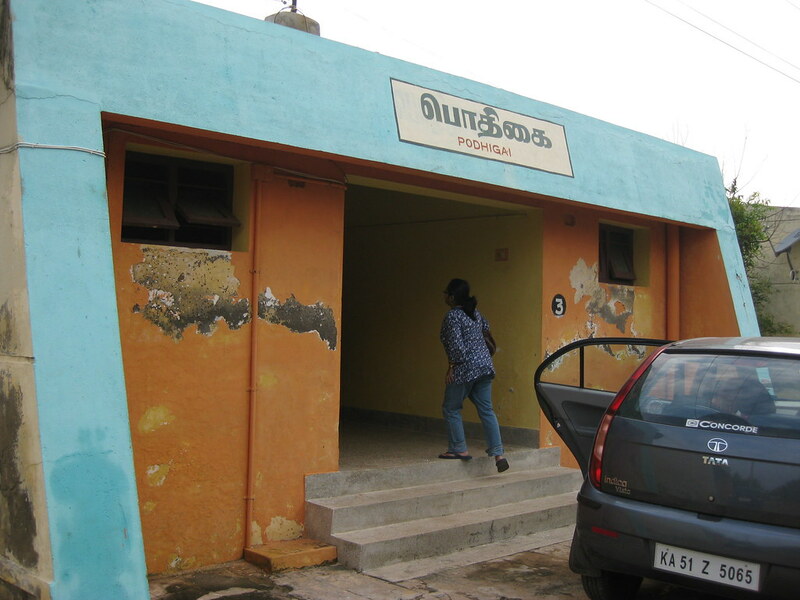 We had a tough time finding a room in Tirunelveli. The next day morning we resumed our journey again on NH7. 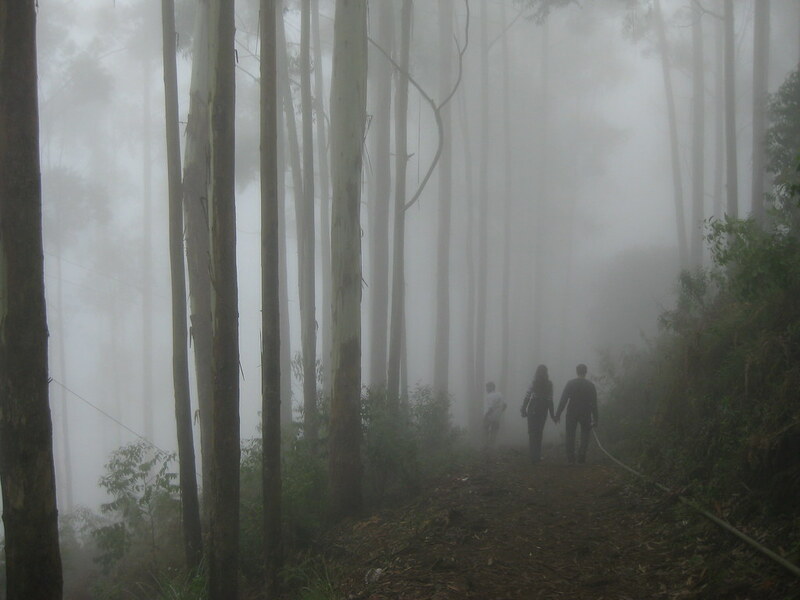 The beauty of Kodaikanal mountains was too hard to resist and we gave in to our temptation. Like most part of our travel, this was again not planned. 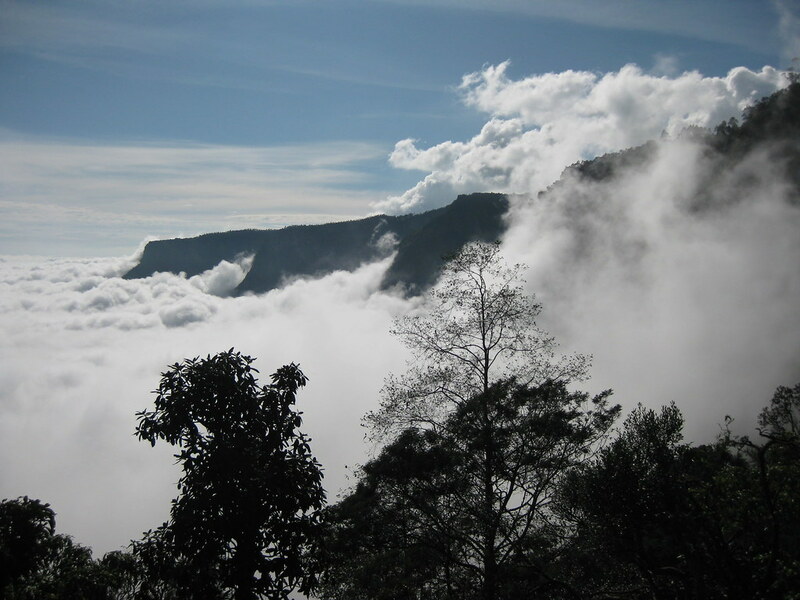 We were soon rising along the twists and turns of Kodaikanal Mountains. 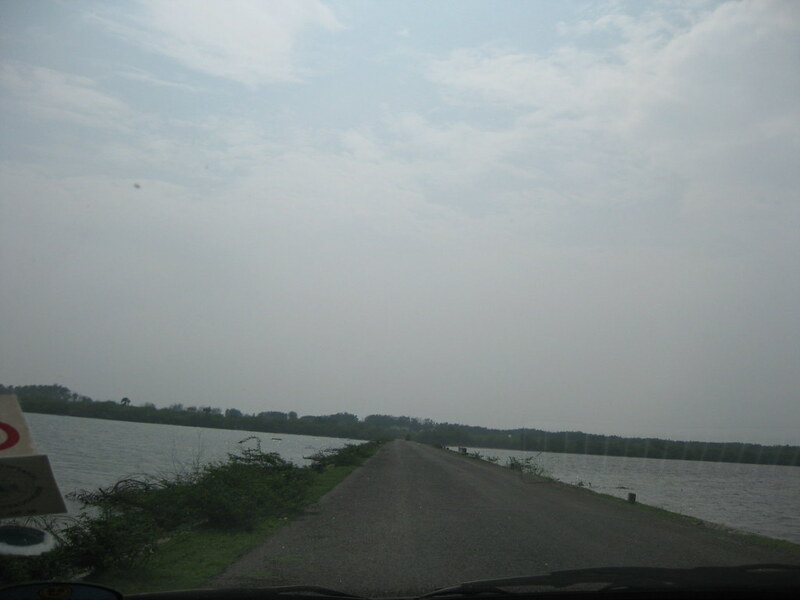 The ghat section was difficult to manoeuver through, that too, for a rookie driver like me, but we managed somehow. The fog was making life all the more difficult. No photos were taken this time on the way up because all were tensed. The scenery was beautiful on one side of the climb, though I was concentrating on the roads mainly. We reached a point, know as, the Falls View. A distant waterfall was visible from this point. It was 4.53 pm. We wanted to cover as much as we could in the daylight. Besides the impending fog was a cause of worry. We continued our journey after a 15 minutes break, at Falls View Point. This time we brought all our experience into play. 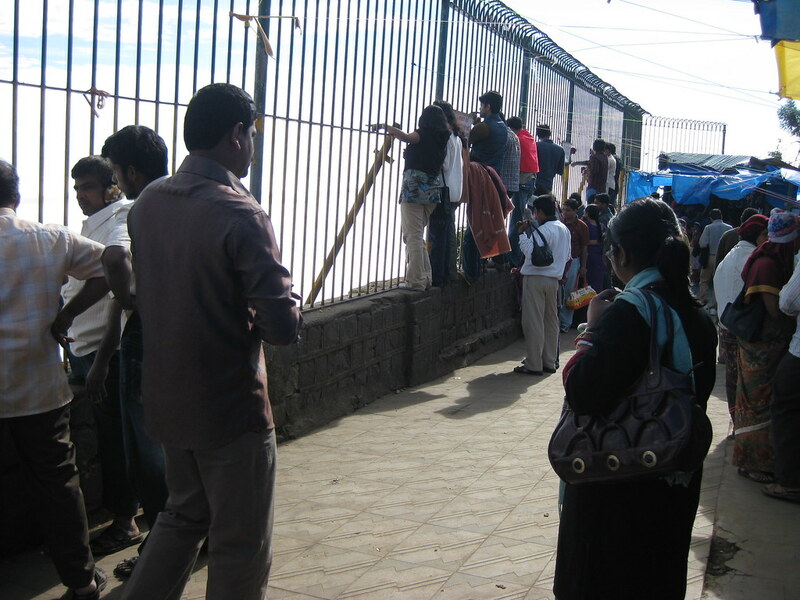 We knew that getting a room in Kodaikanal on Dec 28 (the peak season time) would be difficult. 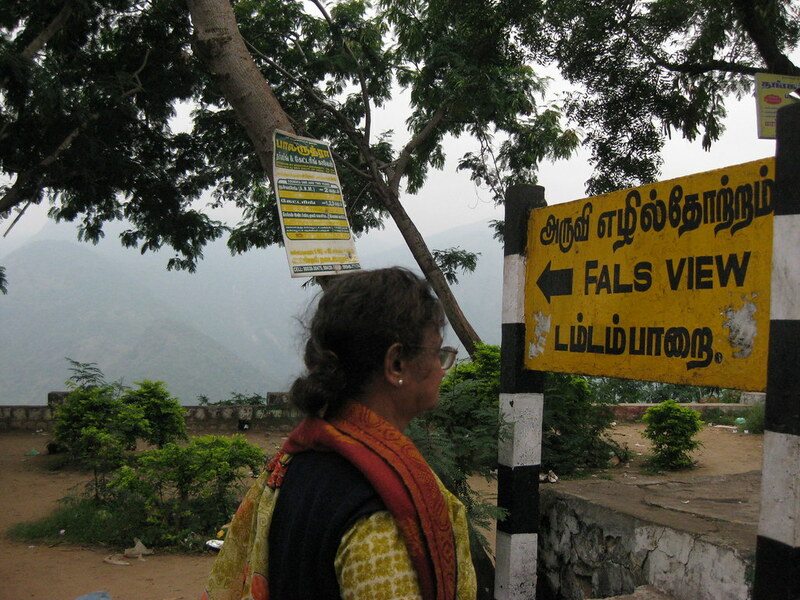 So we started looking for a room much before we reached the highest point of Kodaikanal, unlike what we did in Rameshwaram. And luckily we succeeded in our first attempt (hotel swaminarayan). Hotel rooms were good, neat and clean and spacious. And rent was only 1500 Rs for two rooms, one having two beds and the other having 4 beds. We booked it immediately and then settled inside the room. The long journey had taken its toll and we were dead tired. It was 7:30 pm by then. Total darkness had engulfed the hill. After some more time Uttamda and me went out in search of dinner as dinner was not available in the hotel. We decided not to take the car because it was all fog on the roads, and visibiltiy was poor. We had to walk 2 km upwards to get a shop for food. Parathaas and Omlette were all we could find. 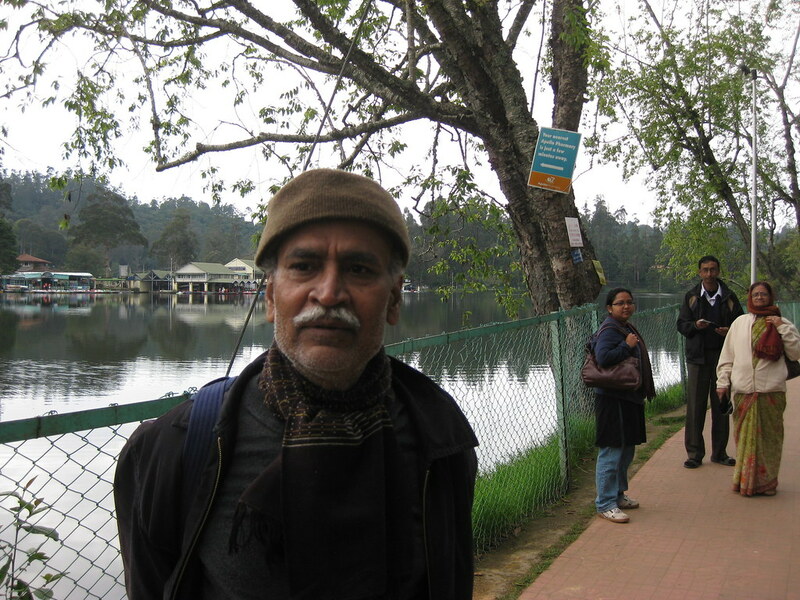 I sat down till late night to write this blog you are reading and everyone else were deep asleep in the cold night of Kodaikanal. But it was not that cold as few of my friends had warned me before. 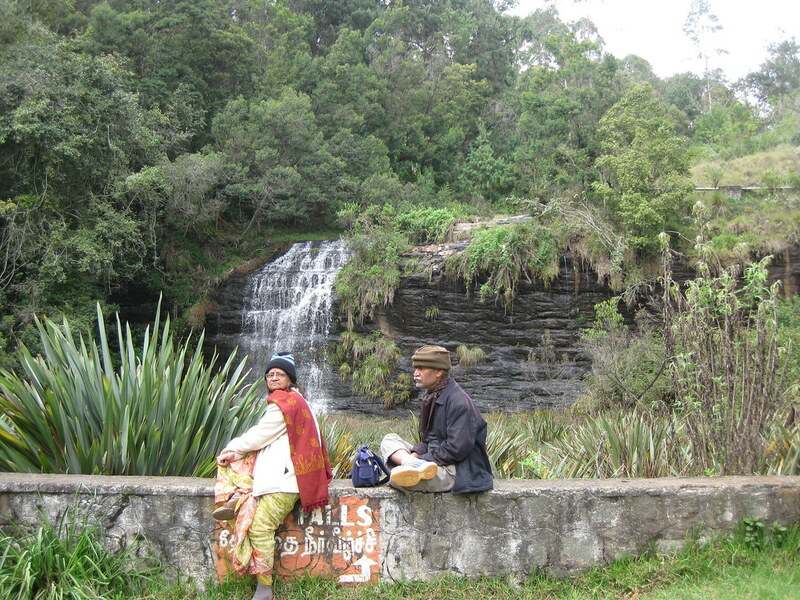 I remember, when we went to Ooty last July, we were shivering in cold. 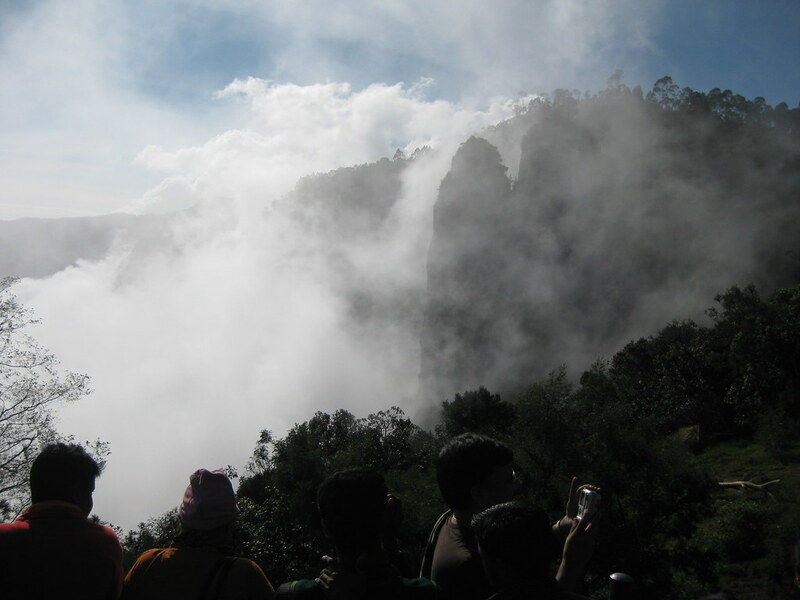 Later on I learnt from the local people that the mist cover of the Kodaikanal acts as a blanket keeping it warm. As the fog clears, temperature falls drastically. Though I didn’t stay longer to validate that statemement, but there was logic in the explanation and that sufficed. Next day morning, I was surprised to see the clear sky and there was no trace of fog. I urged everybody to complete their morning ablutions asap, as we could witness the scenic beauty from the hill tops. Our gang finshed the breakfast there only, as breakfast was available in the hotel restaurant luckily. Nothing like fresh and hot idly, vada, sambar and chuttney. We proceeded to witness the various scenic spots. 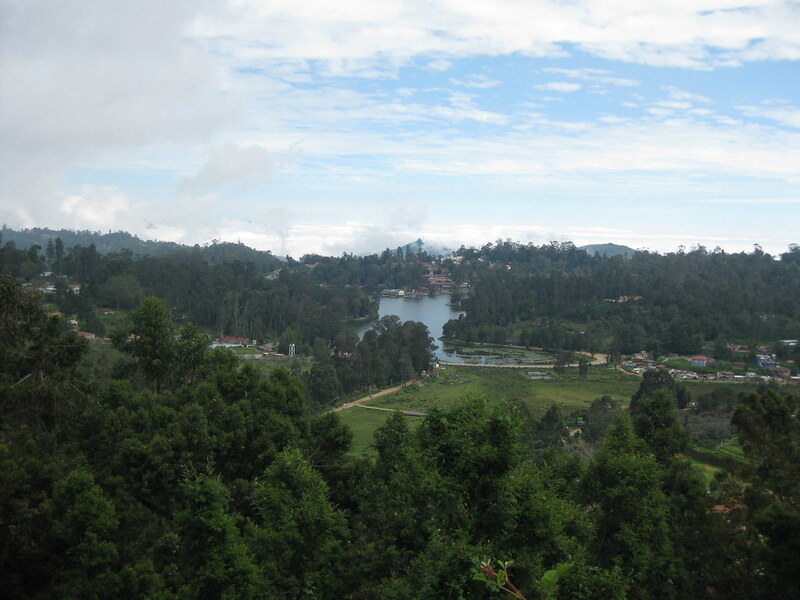 We started with the Kodaikanal Lake which was huge. We drove around the lake and it was a nice one. There were bicycles available on rent if one wanted to cycle around the lake. We didn’t want to do boating in the interest of time. Not much impressed with Fairy Falls. But may be rainy season would have brought a better sight. We realized that it would require a long time to find each scenic spot as all of them were scattered in different roads that were difficult to know. So we hired a tourist guide, bargained his fees down to Rs. 200, and then continued our journey with him. 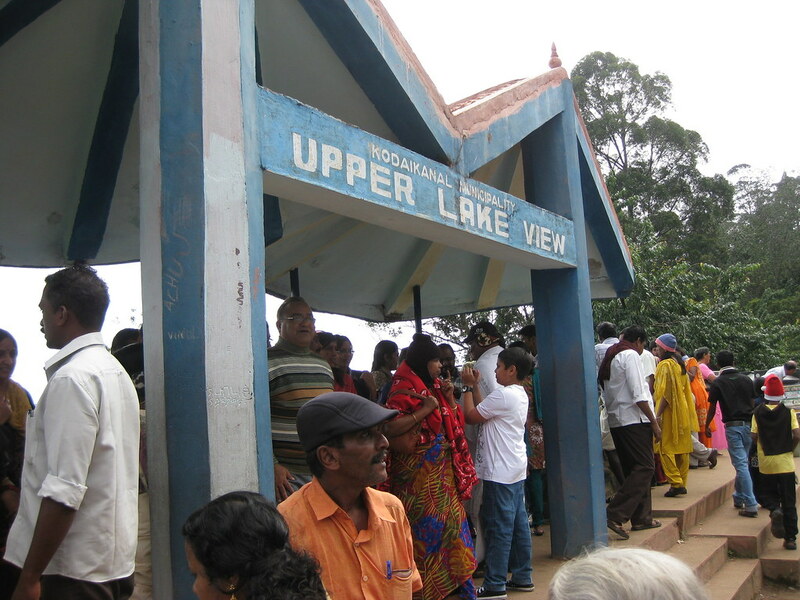 He directed us to the upper lake view of the same lake that you have seen in the picture earlier. We then urged him to take us to the dolphin’s nose. I had heard a lot about it. He warned us of a painful 3 hours trekking (up and down) but we heeded him and went ahead for the view from the dolphin’s nose. Breathtaking sceneries we saw as we reached this point. 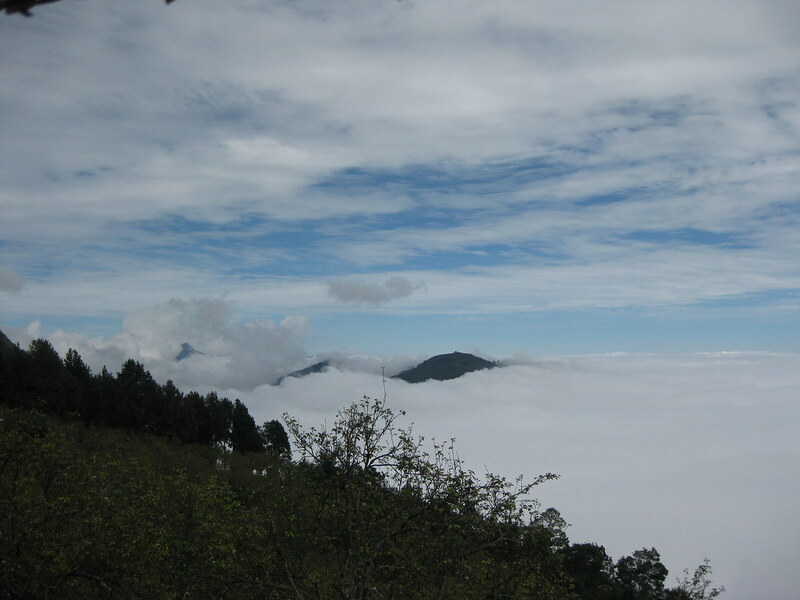 The meeting point of the clouds and the below land was awesome. The trekking began and we were going downwards. It was a descent of 2.5 km, as told by the guide. 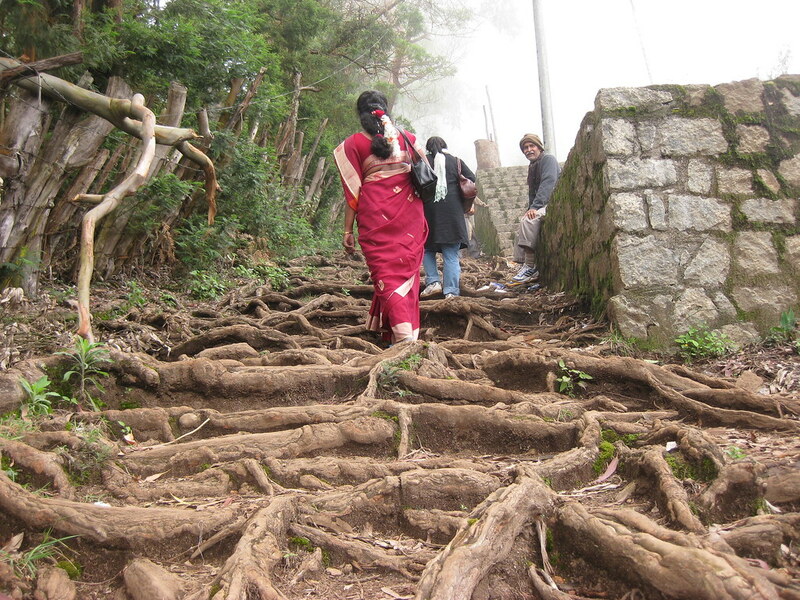 As you can see the roots of the trees have formed the staircases for people to walk easily along the slope. 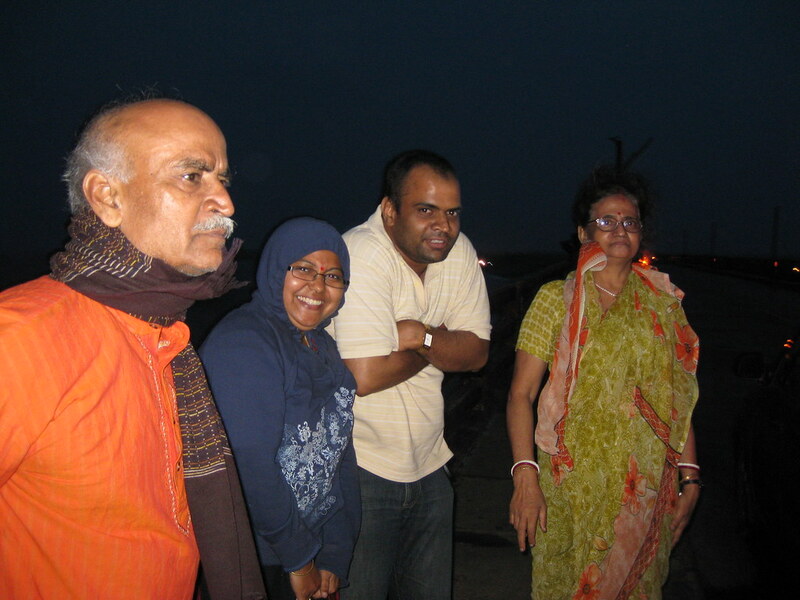 Father, mother and Sanchita decided to sit after reaching mid way, while, Uttamda, the guide and myself marched ahead. Here we got a unique fruit that I had never seen before. This fruit was called Fashion Fruit. Bad Luck. 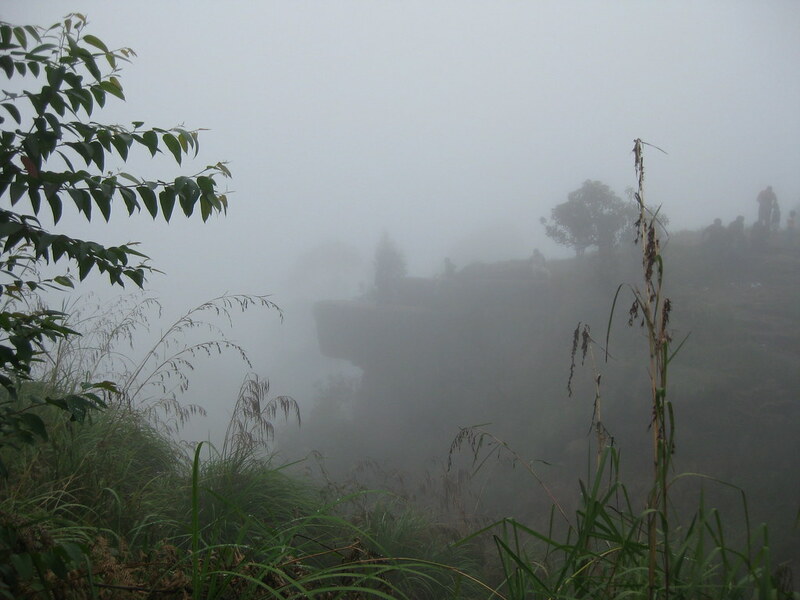 As it was all fog all over and we couldnot see much, from the Nose Tip. 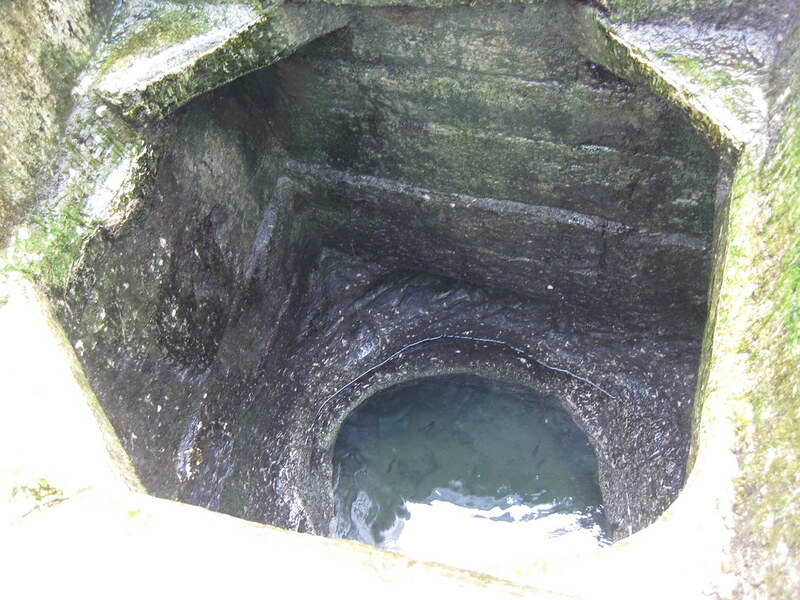 But it was scary and my legs trembled just at the thought of going near the nose tip. So we took photos from a distance. Then we went to see the echo point, and then started our ascent back. Found the folks on the way up. Next Destination was Suicide Point. Then we went to see the pillar view. It was breathtaking. White sun light through mist scattered all over provided a great sight. Next, we went to see Silent Valley. The scenery from the silent valley was also good but too much of fog here also played spoilt sport. Then we decided that we had enough of the views and started the descent. We took a break at nearby market place and bought eucalyptus oil and some other gift items. Bade farewell to the tourist guide for his cooperative and friendly nature, and returned to Hotel SwamiNarayan. We checked out and started our journey towards home. It was a long drive. We were all tired. We soon found NH7 and drove the whole night to reach home. We had to take frequent breaks and by the time we reached home it was the morning of 30th December, i.e, the next day morning. Memorable 6-day trip it was, a long one, and that we will cherish for a long long time. The total trip meter reading was somewhere around 2200 km.